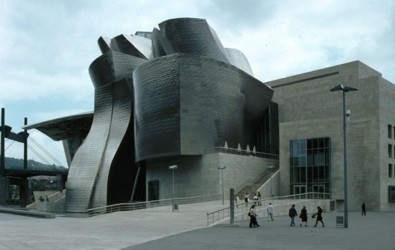 The new Guggenheim Museum of Modern Art (1993-1997) is in Bilbão, in the Basque country . 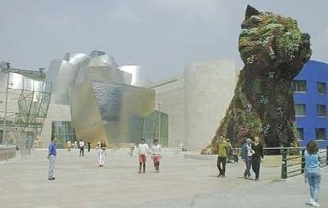 Designed by the North American architect Frank O. Gehry, this unique Museum built on a 32,500 m2 site . On one side it runs down to the waterside of the Nervión River, 16 meters below the level of the rest of the city. One end is pierced through by the huge Puente de La Salve, one of the main access routes into the city. The gallery's titanium exterior is designed to look like rolling waves. The collection inside includes works by Spanish-born Pablo Picasso (1881-1973).